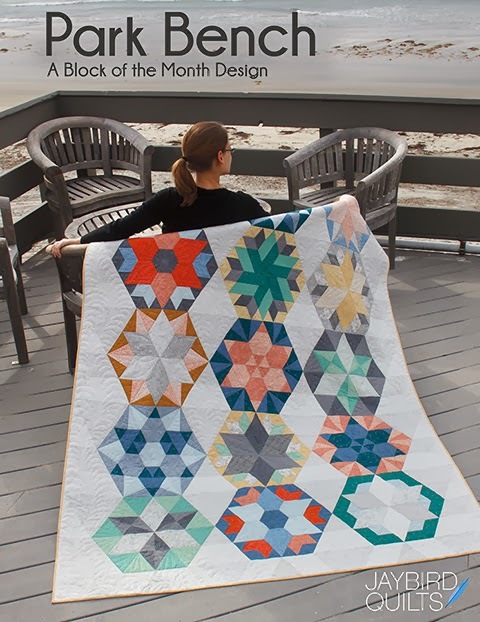 i hope you are ready to make some hexagons!! i've been getting a lot of emails. 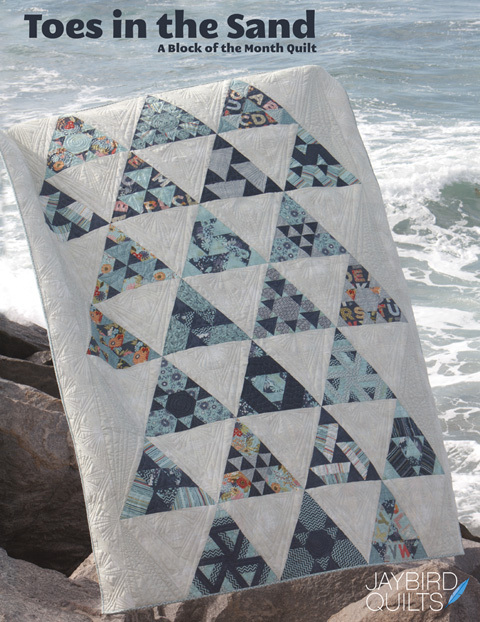 they will guide you through most of the quilt a long! i'm going to go through them for each ruler. the first step is the same for all rulers. it should look like this. 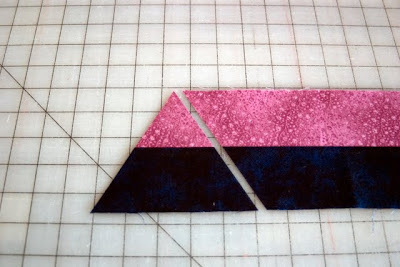 lay the ruler on the strip set like this. continue to cut up & down the ruler. 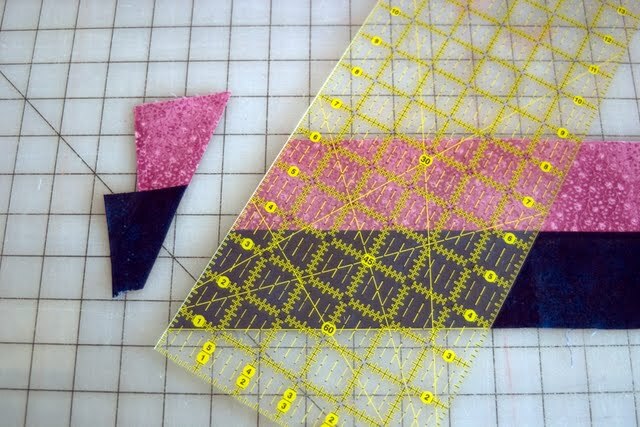 after you have cut the pieces slide the ruler down & repeat until the entire strip is cut. you should have at least 12... but you may end up with 13 or even 14.
the cutting is similar with these rulers. the pack comes with 3... you want to use the 4 1/2" one. 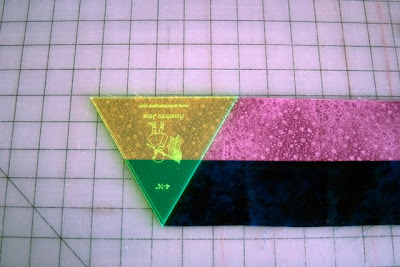 place the ruler on the strip and cut the end off. 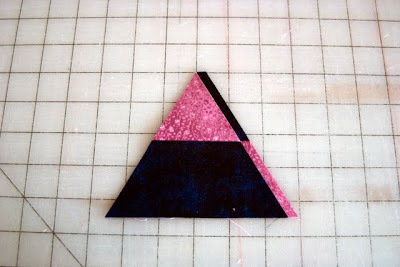 then cut on the right side and cut one triangle. rotate your triangle and repeat for the remainder of the strip. the instructions are the same as above... except that since your ruler is bigger than 4 1/2" you'll line up the bottom of your strip set with the 4 1/2" mark on the ruler. 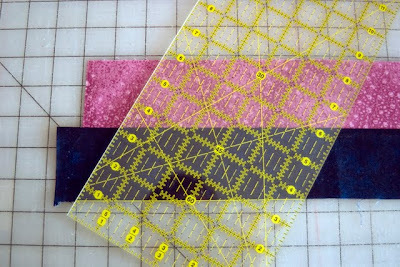 using the 60 degree line on ruler.. place your ruler like this with the line aligned with the bottom of your strip set. 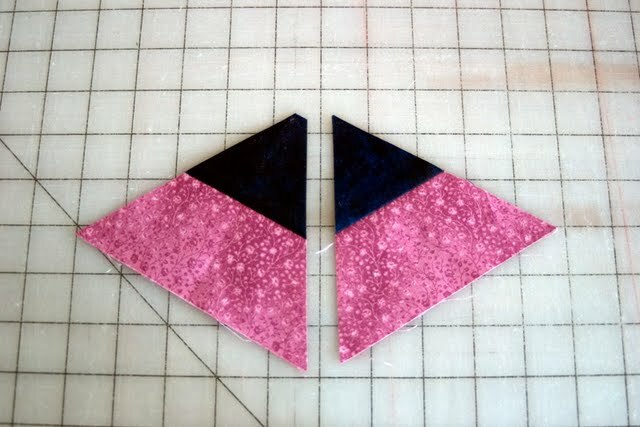 cut off the end of your strip. rotate your ruler and put the 60 degree line on the part you just cut. you should end up with this. 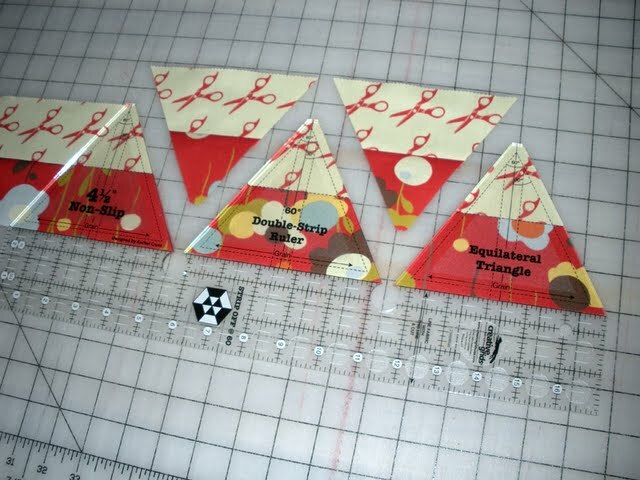 your triangles will not be the same size as mine.. or someone else's. 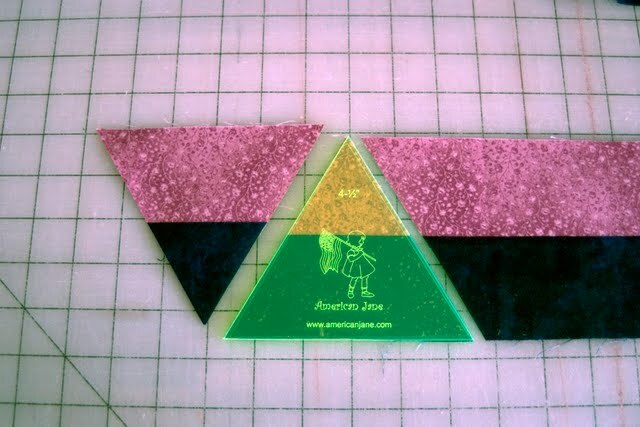 or a 60 Degree ruler with a blunt tip... you'll end up with triangles like the one on the left. or a 6 x 24 ruler you'll end up with triangles like the one on the right. and be consistent because the one is larger than the other. and you don't want to mix them! don't sew all your jelly roll strips & go cutting crazy!! flickr pool - don't forget to add pictures along the way! 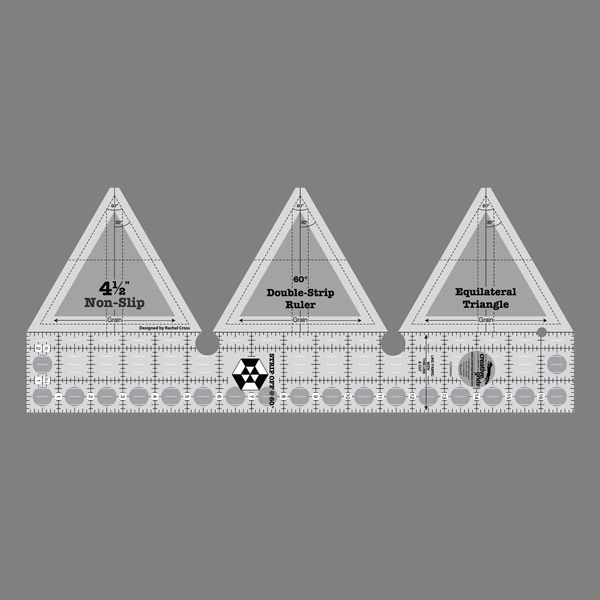 you make using a regular 6"x24" ruler for these traingles look easy peasy. Great Instructions now I just need to put my grandson down for a nap then I can start. Thanks so much. Great tut!! 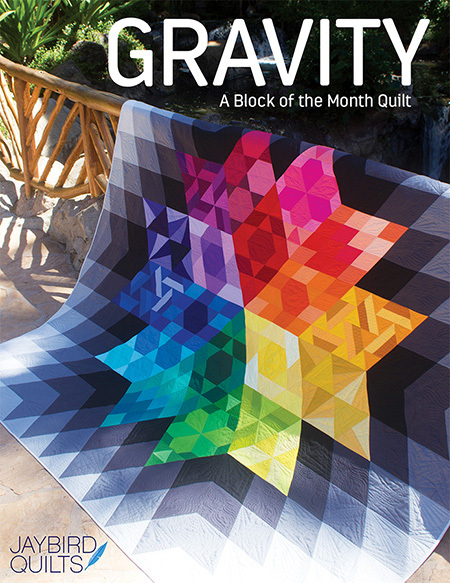 Can't you give us a wee bit of a peek at your quilt? LOL! Yay I am excited!!! Thanks for such good instructions! Aw Jaybird...I am so freakin new to all this quilting stuff I never even noticed the lines on my 6x24 ruler...it is so great to know I don't have to go out and buy something! Now to pick out my fabric and get to sewing and cutting! 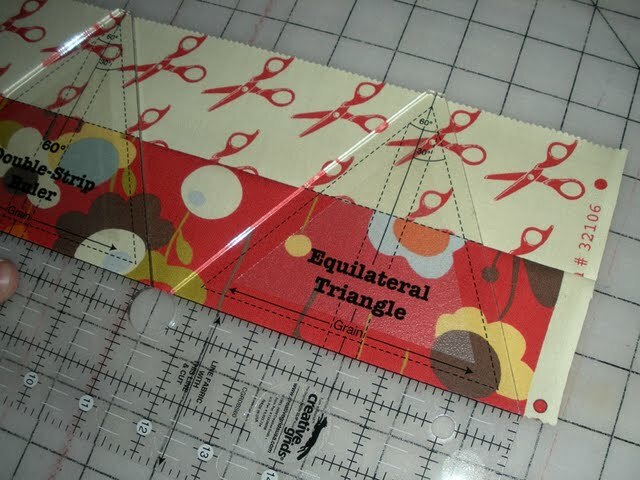 Just realized that I bought a 60 degree ruler (which I have been wanting for some time anyway), but haven't yet decided on fabric! 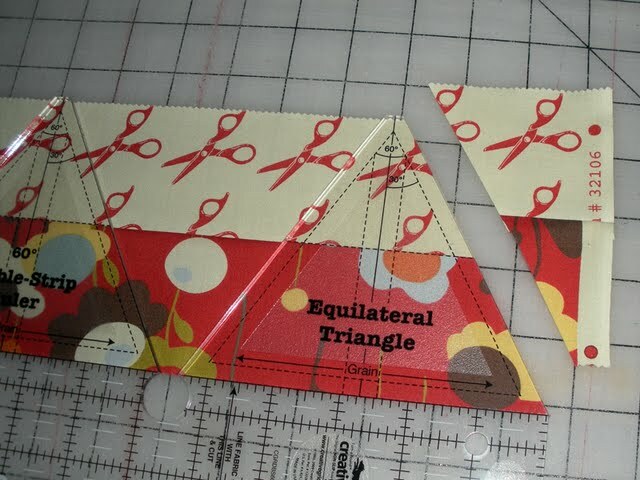 Let's see,if I cut my own (and jelly rolls are about 42 strips, 2 of each fabric? ), I need about 21 different fabrics? Yikes! Destash or trip to fabric store. Must think, think, THINK. 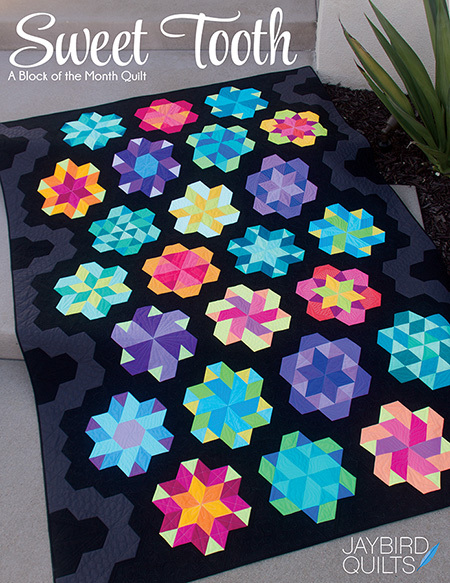 I want to actually start this quiltalong on time. 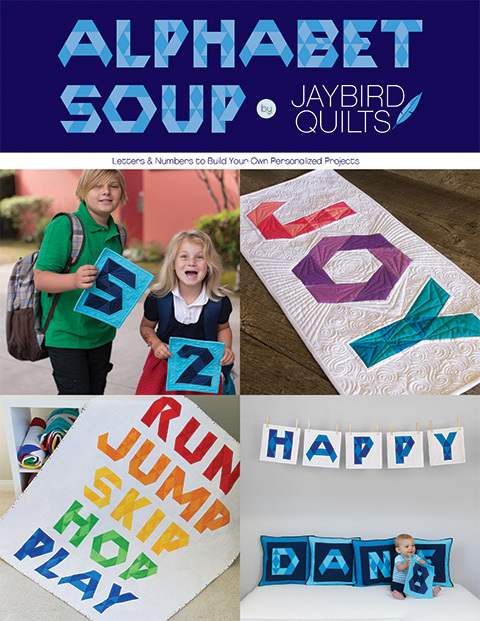 I'm so using this *right now* to make my son's birthday banner! These instructions are fabulous! I haven't been able to find a 60-degree ruler yet, so I appreciate the instructions for a straight ruler. 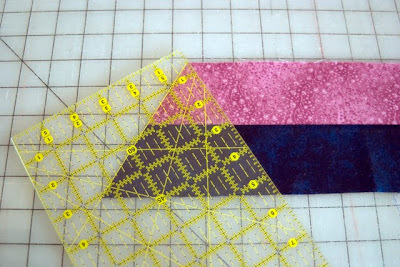 I'm debating using the new LOVE fabrics or some new Kaffe fabrics I just bought. Er, maybe both! So excited to get started! 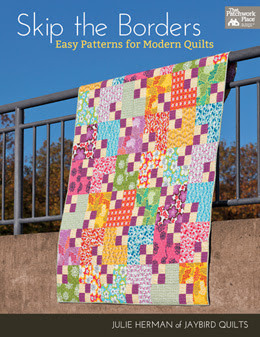 I can't wait to get started ... but my fabric hasn't arrived yet - Darn Canadian customs!! I will be in catch up mode as soon as it arrives (hopefully soon)!! Excellent instructions! Thanks! That creative grids ruler looks really cool. Might have to invest in one of those. Now I just have to wait for my fabric to arrive. It should be here Monday! I want to join but may have to sit this one out but will certainly come by and read the instructions...that one rulers looks awesome!! You have made my day! It's awesome to start early. Oh, thanks for showing this!! I had to go and find one of those creative rulers today. I went to a couple of quilt shops that didn't even realize what they had. They got excited to do something in their stip club with that creative grid rulers. I'm going to start on that pile I sorted out 2 years ago - yay!! Great instructions, Julie! 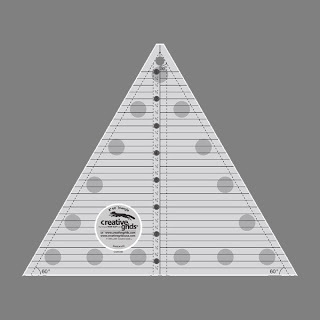 I love the Creative Grid triangle rulers. Oh shoot, I'm waiting for my ruler so I guess I better wait if they are not going to be the same size if I use the 6x24, thanks for the heads up! I can always just make a (small) pillow!! Oh great! Looks easy enough - i wish my ruler would arrive already i'm already behind on this. Good to know about not switching between ruler b/c that is probably what i would've done. I know I am a little late, but I just love this design and will start now at my own pace. Thanks for the idea and wonderful tutorial! Greetings from Mexico City! bee beautiful block catch up! 2 more weeks till i'm an aunt again!